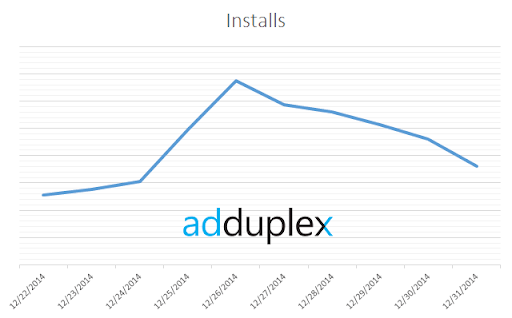 Overall the growth in installs was around 10% on average over December 25th and 26th. So let’s look at the phone models that have grown as much or more compared to December 24th. On the fist glance it could look sensational that BLU’s phone more than doubled in number of installs on Christmas, but the key here is that its total installs per day are in the hundreds compared to thousands and tens of thousands for Lumia models. It is great to see that many of you got Lumia 735 for Christmas – a really great value phone. 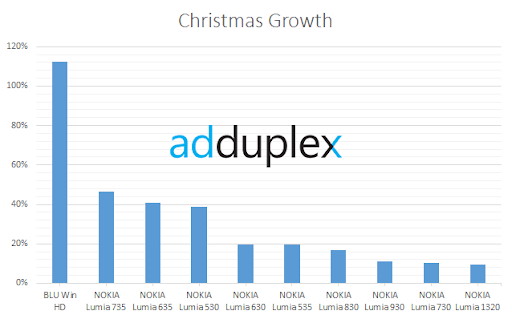 If we look at the growth in absolute numbers it is all in the lower end: Lumia 530, 520, 630, 635 and 625. With Lumia 735 at #6 and BLU Win HD at #19. Let’s see how things progress in our next monthly report. In the mean time checkout our latest report for December.